On January 11, 2019, Mrs. Holly Jennings, Felicity-Franklin FFA advisor was named an honoree for the Golden Owl Award, which recognizes outstanding agricultural education teachers in Ohio. Mrs. Jennings received over 15 nominations for the award from current and former students and school staff. 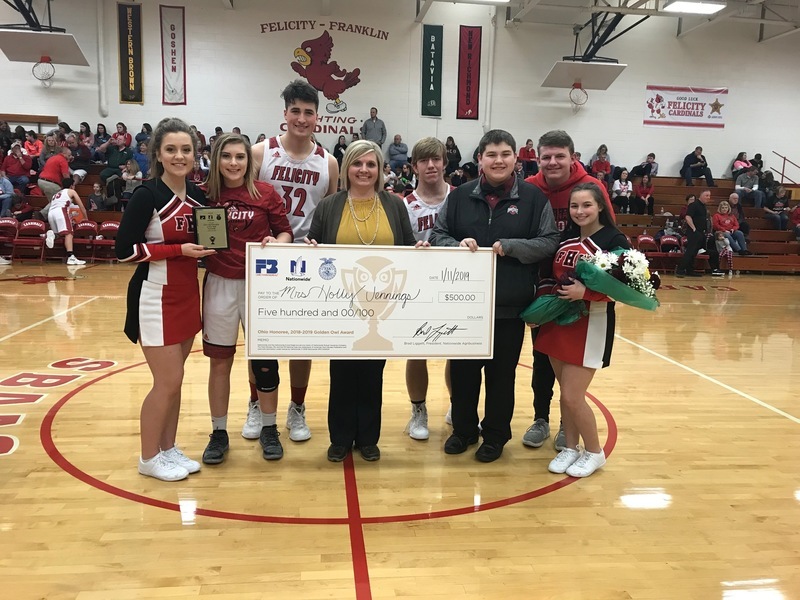 Mrs. Jennings received the award during the Felicity-Franklin homecoming game, where Kolesen McCoy, Ohio FFA President, Heather Utter, Organization Director of Clermont County Farm Bureau, Paul Hall & Anna Stroud of Paul Hall & Associates presented the award along with a $500 check. Mrs. Jennings is now part of the final selection stage after winning Region 4. The chosen grand prize winner will receive $3000 and the Golden Owl Award. Mrs. Jennings has been the agricultural education teacher at Felicity-Franklin Local Schools for 10 years. Prior to her time at Felicity, Mrs. Jennings was the advisor for Lynchburg-Clay FFA. While working for Felicity-Franklin, Mrs. Jennings led many achievements for the chapter and students, including being named a top 10 chapter in the nation 3 times. From left to right: Chapter president Bailey Lowe, secretary Madison Baird, vice president Joey Glassmeyer, advisor Holly Jennings, sentinel Jared Hamilton, student advisor Landen Tull, treasurer Luke Jennings, and reporter Kyra Davidson hold the check earned by Mrs. Jennings for being named an honoree for the Golden Owl Award.